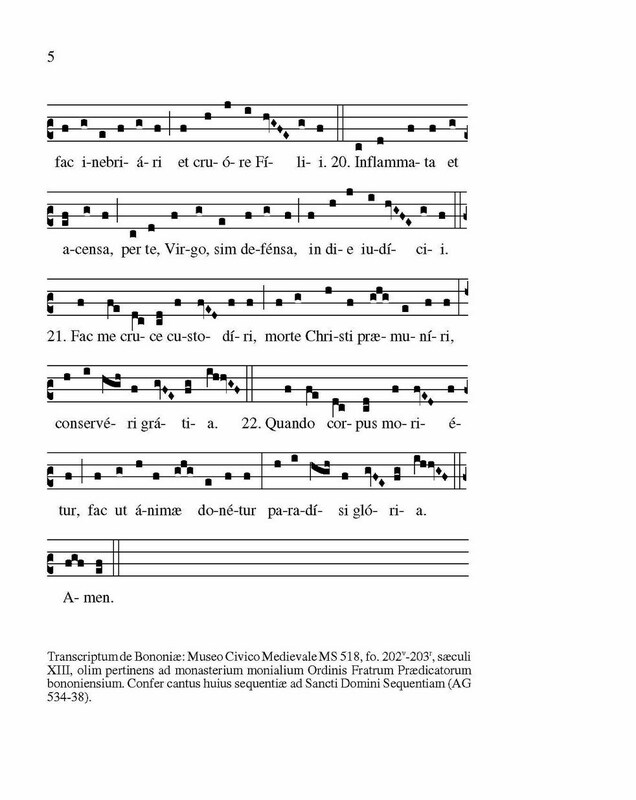 On this feast of Our Lady of Sorrows, formerly the Seven Sorrows of the Virgin Mary, I thought it would be suitable to present to our readers a transcription of the text and music of a thirteenth-century version of the Stabat Mater, recently discovered by Prof. Cesarino Ruini in a manuscript that once belonged to a convent of Dominican Nuns in Bologna, Italy, and on which I have recently posted. A miniature of the Bologna nuns, from their manuscript, decorates this post. The discovery of this manuscript, as explained in the article available here (in Italian), shows by the date of the manuscript that the traditional ascription of authorship to Jacopone of Todi can no longer be sustained. The date, however, leaves open the possibility, often mentioned, that it is the work of Pope Innocent III. 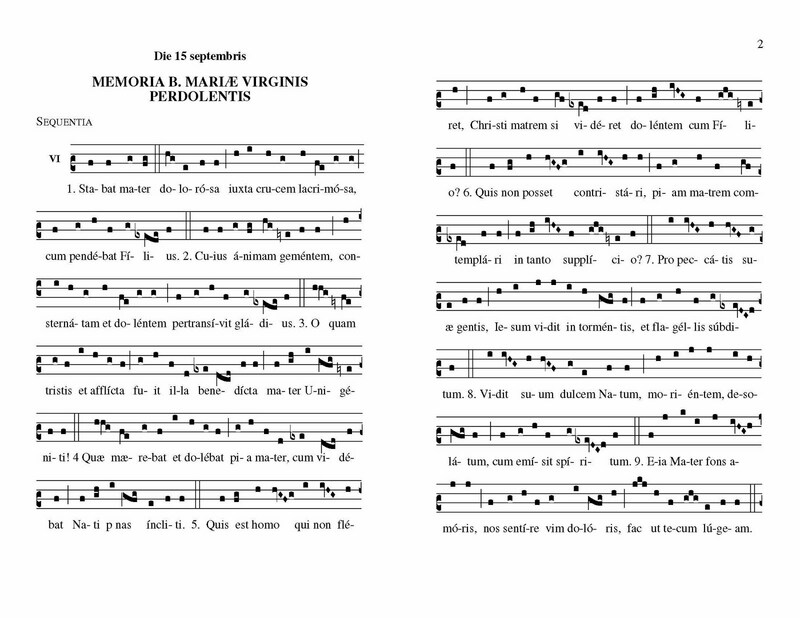 Perhaps it was composed by the Dominincan nuns of Sant’Agnese in Bologna. This version is interesting for a number of reasons. First, this is the earliest use of the text as a sequence. 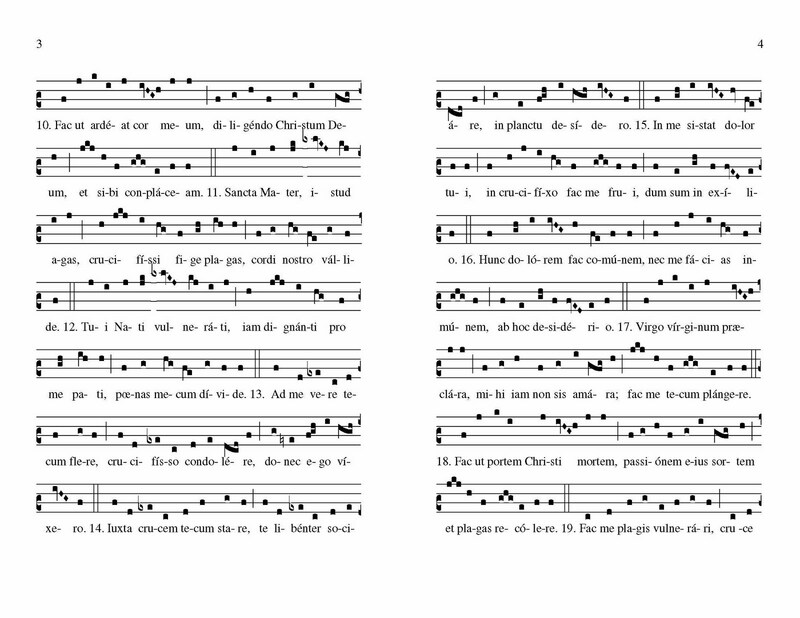 Until the discovery of this version, it was only known as a hymn until the late middle ages. This manuscript shows that the earliest known use of the text as a sequence was among Italian Dominican nuns in the 1200s. Next, the text includes not only a number of verbal variants, but also includes two verses absent from the commonly received version. Those who wish to examine these can download my transcription and compare the text to the received version here. Even more interesting is the music. As pointed out to me by the Dominican nuns of Summit NJ, this ancient sequence borrows, with the exception of one stanza (cf. 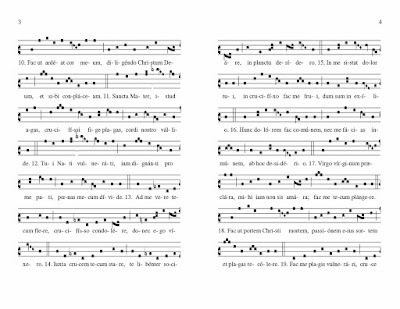 verses 19 and 20), the melodies of the Sequence of St. Dominic in the Dominican Rite. There are a number of minor musical variants as well. 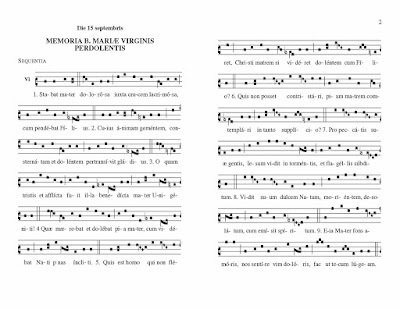 Those interested might want to compare the music to that found in the Dominican Gradual for the Mass of St. Dominic. 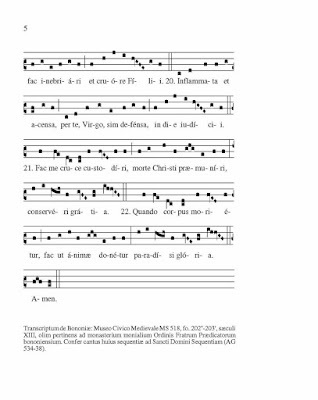 Through the kindness of a reader who converted the PDFs of this music into JPGs, here are images of the newly discovered 13th-Century Stabat Mater. I am aware that these images are a bit blurry; if you click on them or download them, you will get a clearer image.